“I demand to have some booze!” declaims the man smeared in Deep Heat. His greatcoat sleeves are pushed up past the elbow and he wears a pair of pink Marigolds, a desperate attempt to gain at least a little protection from the blood-thickening cold – “It’s like Greenland in here,” he despairs, flapping his hands like the theatrical type that he is. With his gown-like coat and rubber gloves, he looks like some kind of anti-surgeon, the one who sentences you to death by MRSA. “I demand to have some booze!” he says. Just one more perfect line of dialogue in a perfect film. “But nothing’s perfect,” you’ll say, and I’ll agree… mostly. Nothing’s perfect. 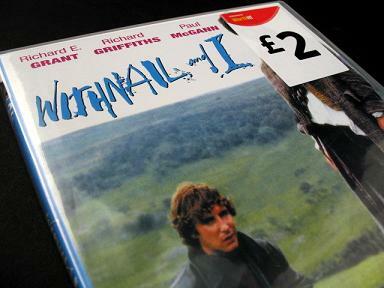 Except this film, Withnail And I.
I first saw the film in June 1988, a couple of days after I turned 21. “I demand to have some booze!” he said. An appropriate demand for a 21st birthday I thought, and now I think it’s fine for a 40th birthday too, though maybe expressed a little less forcefully, and perhaps with the subtext “Actually, just a small one – I’ve got to take the kids swimming in the morning”. But in the film, he demands to have some booze because he is an alcoholic, one who is about to lose the remaining trappings of a civilised upbringing – though not quite yet. He has a ‘holiday’ in the Lake District to endure first. The year is 1969; he is an out-of-work actor who lives in a decaying, nicotined, wine-reeking Victorian villa – or a flat therein, at any rate. His craving is a symptom of his inability to confront the realities of work, of talent, and of life; as the fragile web of so much 1960s thinking began to break on the 1970s’ emerging thorns, it was a despair that must have faced many. There he stands, on the threshold of a new era. He has a choice: to slip imperceptibly into more sober times, or to continue dying with his drink as the decade passes away. It’s funny, because summer ’88 brought tumult of its own: drugs, hedonism and new music – a whole new Summer of Love in fact. “They’re selling hippy wigs in Woolworths, man,” laments the tunnel-eyed drug dealer in Withnail And I; “They’re selling acid house T-shirts in Topshop, man,” I could have added as the summer of ’88 played itself out in predictable, and inevitable, fashion. But I was never called on to face down reality in the way that happens to this man; at 21 in 1988, we had already known life in a grimmer Britain. We had never “…never had it so good”. We were just taking a break, and we always knew what was waiting once the holiday was over. I watched Withnail And I twice more that week, and I’ve been back to it so many times since then. I don’t know another film that’s so deeply watchable, and I wonder what it is that makes it so: it’s hilarious, it’s heartbreaking, it’s poetic; its characters are true and alive, so much more than mere transports for a plot; its sheer atmosphere says so much about the era – it’s dank, and desperate, and paranoid to the point of insanity; and though it’s far from being a happy tale, it also charms in a way that British films so often attempt but rarely manage. All these things contribute to the pleasures of each repeat viewing, but other films have these qualities too, yet they don’t bring me back again and again like this one. In the end, it seems to be this: long after every revelation of character and plot has been worn from the celluloid, there’s still the sheer goose-bumping pleasure of hearing those words one more time: “We’ve gone on holiday by mistake,”; “As a youth, I used to weep in butchers’ shops,”; “We have indeed drifted into the arena of the unwell,”; and on, and on. Not so long ago, I had a grand vision of a 40th birthday celebration for myself that would weigh heavy with sentiment, humour, significance and emotion. As someone who has never relished being at the centre of things, I wondered if maybe the time had finally come to ring-master a lavish entertainment dedicated to the very fact of me reaching yet another threshold: the precipice of my fifth decade. The event would take place in a cinema. A grand parade of friends and acquaintances would stream past me, clutching at me and making solemn, silent contact; we would lock gazes, and nod, and years of shared laughter and sadness would flash between us. We would then take our seats and on would come Withnail And I; we would watch it together, guffaw together, weep together. It would be both celebration and homage – not to me but to the film, and thereby to the fact of its ever-presence in my life at 40. It was an impressive plan I thought, and I made a few tentative enquiries at various art cinemas I felt might help carry out such a mission. Yes they said, that wouldn’t be a problem. All I had to do was name my day, confirm my choice of film, and pay up. I was delighted, and I prepared to go through these motions. Except… did that really seem like the kind of thing I would do? Plan something a year in advance, and invite many many people, and expect them to come, and expect them to enjoy it, and feel responsible for dragging them away from things they would have preferred to be doing… all in my honour? Even as I planned to set the wheels in motion, I knew I would never bother. And so now I turn 40, and I have some drinks with a few friends – I politely ask to have some booze – and at no point do I make a speech, or take applause, or face the threshold alone. Just how I like it. I do, however, watch Withnail And I. Not by spending hundreds of pounds to hire a cinema and paying to entertain everyone I’ve ever known, but by splashing out the sum of two English quid for the DVD in Woolworths. There are no bonus features, no accompanying booklets, no animated menus or choices of language. It’s just the film, in muddy grey-green Sixties-O-Vision, with that muffled soundtrack that was never very clear – even in Coventry Odeon in June 1988. It’s just the film. And whatever your age, that’s all you need. If by chance you’ve never seen Withnail And I, you can discover more detailed information about its characters, plot and how it came to be made here.